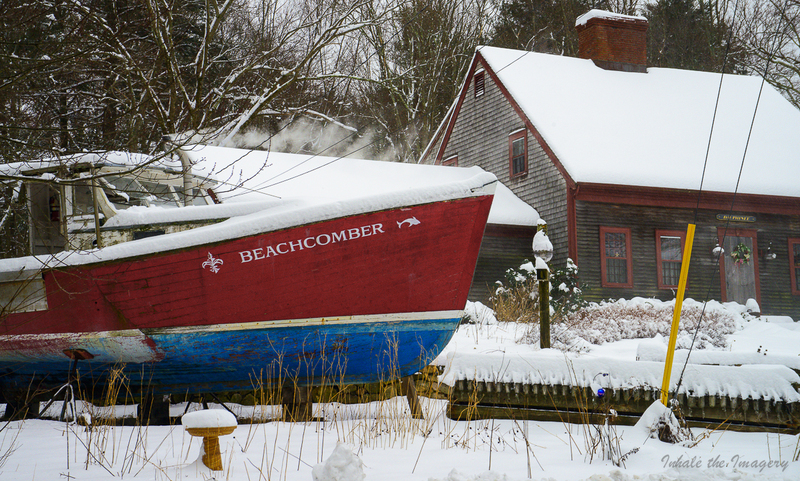 Day 78 of SP… Much snow this morning so found one of my favorite “out to pasture” lobster boats. Observations: There is always a guy-wire in the way of a nice shot.. Birds won’t be swimming in that bath for a few more months.. The Lobsterman (retired maybe) has a fire stoked in his old-colonial home.. Bet its nice and warm inside. Best that the Beachcomber is not out to sea today, but if it was, it would be quite the ride for the old gal and its captain; memories of the ole days it would be…I look at the boat; where blocks are now, water once slapped under hull; dirty-film covered window once clean and looking for buoy… Sun is rising, but not seen to the left of me.